This Festival is presented by the New Haven Chamber of Commerce in conjunction with the Pepsi Balloon Race. Presented by the Pepsi-Cola Bottling Company of New Haven and featuring a spectacular Balloon Glow, Race and Festival. All events are free and open to the public. The race is celebrating its 30th anniversary this year. 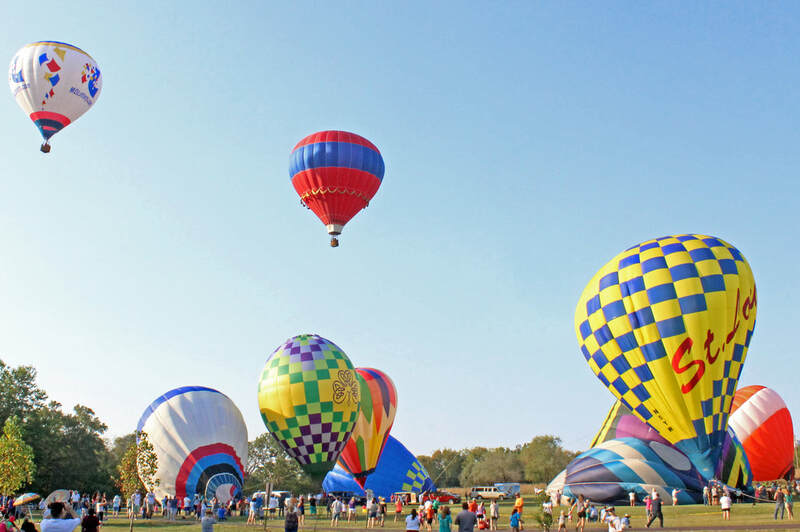 Attendance is free to more than 1,000 spectators who come out to watch over 20 balloon pilots compete in a race that is almost as exciting from the ground as it is in the air. The Balloon Glow offers breathtaking views of inflated balloons lit by their burners. ​Held at the City Park and is a walk through event only. The race begins when the lead "hare" balloon takes off. Over 20 "hound" balloons take chase. The hound that drops its bean bag closest to the hare balloon is declared the winner. Concessions available for purchase. Proceeds benefit the New Haven Chamber of Commerce. Park drive will be closed for both events and you are encouraged to park on Lions Drive or in the New Haven School & Municipal Swimming Pool parking lots. For Festival questions, contact chairman Craig Montgomery at 314-805-9542.